BATON ROUGE, LA (WAFB) - No. 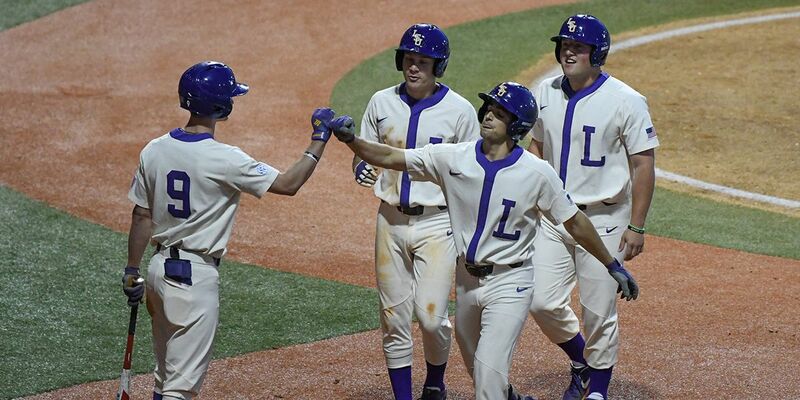 9 LSU in the throwback uniforms had no problems at the plate against Grambling in a shutout win Tuesday night at Alex Box Stadium. LSU had a monster third inning in the 9-0 win over Grambling, including a three-run home run by Josh Smith. Clay Moffitt started on the mound for LSU and got the win. He only allowed two hits and struck out five batters. He is 2-0 on the season. In the first inning, Antoine Duplantis scored on a groundout by Chris Reid to give LSU the 1-0 lead. LSU scored seven runs in the third inning. A bases-loaded walk scored Zach Watson. Then, a single to first base by Cade Beloso scored Reid. A sac fly to center field by Brock Mathis sent CJ Willis and DiGiacomo home. Later, Smith stepped up and crushed one to right field. LSU added another run in the bottom of the eighth inning. LSU improved to 20-9 on the season, while Grambling dropped to 12-13. LSU will face South Alabama at The Box at 6 p.m. Wednesday.